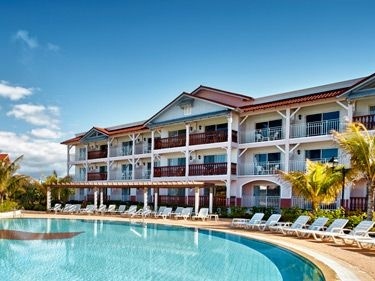 The Barceló Cayo Santa María Caribe & Tropical Resort is no longer under the Barceló Premium banner, but administered by the Memories Hotels & Resorts group (a division of Blue Diamond Hotels & Resorts) under the name of Memories Paraiso Beach Resort (formerly the Caribe sector) and Memories Azul Beach Resort (formerly the Tropical sector). Consider this page as a reference only. Barceló Cayo Santa María Caribe & Tropical Resort is located on one of the world's most stunning beaches. The resort is an integral part of the abundant flora and fauna of Cayo Santa María, declared a Biosphere Reserve. Suite: 12 rooms with separate living room, bedroom with 1 king size bed, sofa and table in the living room, all rooms equipped with: Telephone, 2 satellite TVs, private bathroom with bath, hydromassage, superior amenities, walk-in closet, hair dryer, hot and cold water, safe, minibar with water, beer and soft drinks (which is restocked daily), air conditioning, 220 V, terrace or balcony, iron and ironing board and CD reader. Maximum capacity 2 adults or 2 adults and one child. Village just outside the hotel with a la carte restaurant services, a bowling alley, disco, ice cream parlour, Spa, beauty salon, gym, piano bar, jazz bar, honey and tobacco store, conference rooms, post services and DHL, a bank, boutiques… just 5 minutes from the hotel. At this moment there is no public offer available for the "Cayo Santa María Caribe & Tropical Resort". Contact us if you want an exclusive deal for this accommodation.